Let's start at Pickering to understand the issue, which is the productive life of the generating assets. From last fall and a column by nuclear expert Jerry Cutler. But in 2009, OPG, together with industry partners, including COG [CANDU Owners Group], had launched the Fuel Channel Life Management Joint Project to examine evidence that the operating life could be significantly extended. So OPG applied to the Canadian Nuclear Safety Commission for permission to increase that EFPH limit. Receiving the commission’s go-ahead was contingent upon satisfying a number of criteria and clearing a key licensing hold point that Pickering would not operate its pressure tubes beyond 210,000 EFPH until approved by the commission. Pickering 6 is one of four Pickering B units: Ontario's reactors were built in sets of four starting with Pickering A (units 1 and 4 are refurbished, 2 and 3 removed from service), then Bruce A, Pickering B, Bruce B and Darlington - in that order. I've stuck to IAEA PRIS data, but this chart shows why it's somewhat problematic. I show the average hourly 2015 output for Bruce units 3 and 4 exceeding the PRIS "Reference Unit Power," which contributes to its accumulation of EFPH. Regardless Bruce 3, which first produced power in 1978 is older, and has greater output, than Pickering 6 (1983). 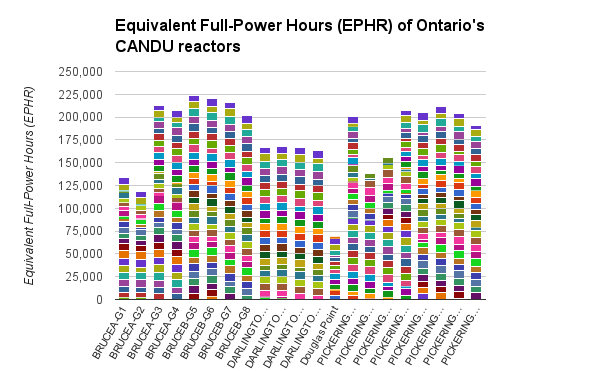 Because all 4 reactors at Bruce A were idled for a number of years, both these units now show a little over 210,000 EFPH (Bruce 4 is just behind). Bruce Power feels they have extended the periods Bruce 3 and 4 can operate, and there's no evidence the regulator disagrees. West Shift program: West Shift, a six-month outage in Unit 3, allowed crews to move fuel channels back to their original positions compensating for the elongation which occurs after many years of operation. Each channel was cut free from the reactor and re-welded into place to ensure the operation of the reactor through at least the end of the decade. The Ontario government's Long-Term Energy Plan, released late in 2013, displayed a schedule for refurbishments. Bruce Power could predictably find the scheduling of reactor 4 for refurbishment next year problematic as it finds pressure tubes acceptable for "several years" beyond the five-year license extension it is now seeking. Reactor 3 is a better situation, as it's scheduled to begin refurbishment in 2019, but that's still within the period of the license extension. Considering these are the only refurbishments scheduled prior to 2022 on the reactors operated by Bruce Power, it's not surprising there's been a lack of urgency in the negotiations. 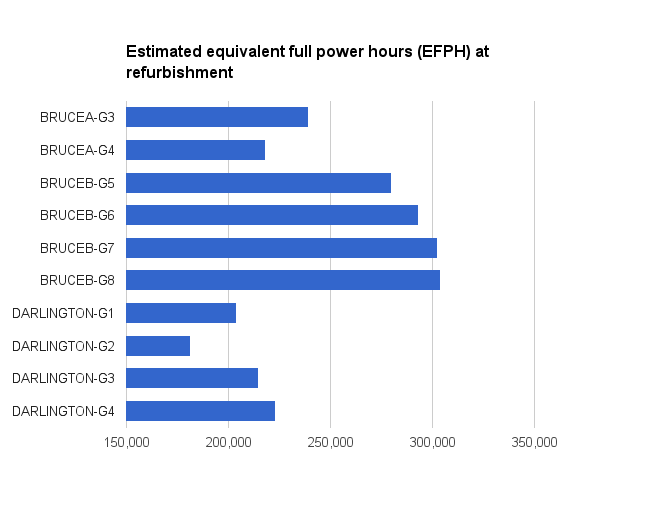 What is surprising is that Bruce B's four reactors are expected to operate 5-7 years beyond 247,000 EFPH prior to refurbishment (using the figure from Pickering as guideline), while the newer four Darlington reactors are scheduled to operate 3-8 years less than it would take to acquire 247,000 EFPH. The Darlington refurbishments do look to be on a similar schedule to what was followed for CANDU 6's at Point Lepreau and Wolsong 1. Perhaps the ministry is suspicious of Canada's engineers and operators. I might accept an explanation of the difference between finding Pickering B eligible to operate longer but not Darlington in the size difference between CANDU 500B and CANDU 850 units is significant, except Bruce B's CANDU 750 B shouldn't be much different and those are being scheduled for refurbishment after operating for about 40% more equivalent full-power hours than the Darlington units will have operated for prior to their refurbishments as scheduled in the LTEP. That is a difference of many years. ...the OPA shall continue to work with Ontario Power Generation (OPG), Bruce Power, and the Ministry of Energy to ensure that the Plan includes an updated coordinated refurbishment schedule. It appears the "coordination" simply involved pushing up Darlington's refurbishments and ignoring the life-extension engineering work of operator Bruce Power; it wouldn't be the first time the Ontario government devalued Darlington for suspect reasons.